The traditional, pastoral ambiance provided by an old-fashioned lantern with a flickering candle is truly irreplaceable with modern electric lighting systems. Build your own rustic-style lantern with basic materials and achieve this look instantly. Display the lantern inside your home to add a touch of country décor, place it in your backyard to light up summer gatherings or set out many lanterns to create the mood at a rustic-glam wedding. Remove glass and backing from picture frames. Lay one frame face down on your work surface. Lay a 8-inch wooden slat down the back of the frame, and slide it to the center of the short edge of the frame. Make sure its ends are aligned with the top and bottom edges of the frame. Use a pencil to mark the position of the slat on the back of the frame, then remove the slat. Squeeze glue onto the back of the frame where the slat will lay and place the slat back in place. Let dry. Repeat this method to glue a 6-inch slat perpendicular to the 8-inch slat. Ensure that it is placed in the center of the long edge of the frame. Let dry. Continue the same process to secure both slats to the backs of the other three frames to create a window-like appearance on each. Select a single frame and stand up on its short edge. Stand up a second frame and line up so that it stands perpendicular to the other frame. Align the edges so the side edge of the first frame is flush with the front of the second frame. Insert a finish nail into the front corner of the first frame where it meets the second frame. Drive the nail through the first frame and into the second one until the nail head is flush with the front of the first frame. Place the tip of a flat-head nail against the head of the finish nail, and begin to hammer it. Use the flat-head nail to drive the finish nail approximately 1/4-inch into the wood. Set the flat-head nail aside for further use. Line a third frame up so that it is parallel to the first frame. Make sure the short side edge is flush with the front of the second frame. Drive a nail through the upper left corner of the third frame into the second frame where the two meet, creating a mirror image of the opposite side which you already nailed. Insert a fourth frame between the first and third frames. Align the front flush with the sides of the first and third frames, and drive a nail through the corner of each of those frames where the frames meet to join them together. Place a 7-b- 7-inch square on top of the four-sided frame fixture. Center it atop the four frames. Use a pencil to mark two points on each side of the square where each frames will attach. This will be approximately an inch from the edge of the square on every side. Hold the wood still, and drive a nail through the wood and into the frame at each pencil mark to secure the wood to the four-sided frame fixture. Sit the entire project on top of the second 7-by-7-inch square. Center the finished part of the project on top of the square so that it is aligned with the other square. 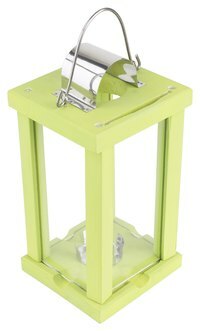 Select the side to be hinged of the lantern to be hinged. Open the hinge to 270 degrees, and place one half along the frame and one half on the wooden square. Slide the hinge to the center of the side you will be hinging. Insert screws into each hole in the hinge. Be sure to attach both sides securely. Turn the entire project upside down; the most recent square attach will become the lid of the lantern. Place a 4-by-4-inch square atop the lid and center it. Mark two points on the square, both more than 1 inch from all edges. Hammer nails through both points and into the lid of the lantern to secure the square to the lid. Center a 3-by-3-inch square on top of the 4-by-4-inch square and repeat, driving nails through the square into the previously attached square to secure the two together. Keep nails at least an inch from all edges. Center a wood finial on the 3-by-3-inch square. Mark its position with a pencil, and add wood glue to the designated mark. Press finial into the glue and let dry. Open your lantern and insert a candle in a votive. Artificially age your wood prior to construction to add to the old, rustic look of your lantern.